Discover the secrets to healthy eating! Order your copy of Change Your Diet, Change Your Life today and you can discover for yourself just how quick, easy – and delicious – it can be to make a long-lasting difference in your good health. Make Small Changes and Get Big RewardsDiscover the “fad-free” eating strategy that is easy to follow, with foods you’ll enjoy…with meals you’ll savor…and with the healthful results you want most!Order your copy of Change Your Diet, Change Your Life today! You can look and feel better, protect yourself against age-related diseases, and add years of active living to your life – when you learn the “trade secrets” revealed in this just-published report from the nutrition experts at Tufts! You do all you can to take care of yourself. Your health matters to you. You stay up on those advances that can help you live a healthier and longer life. 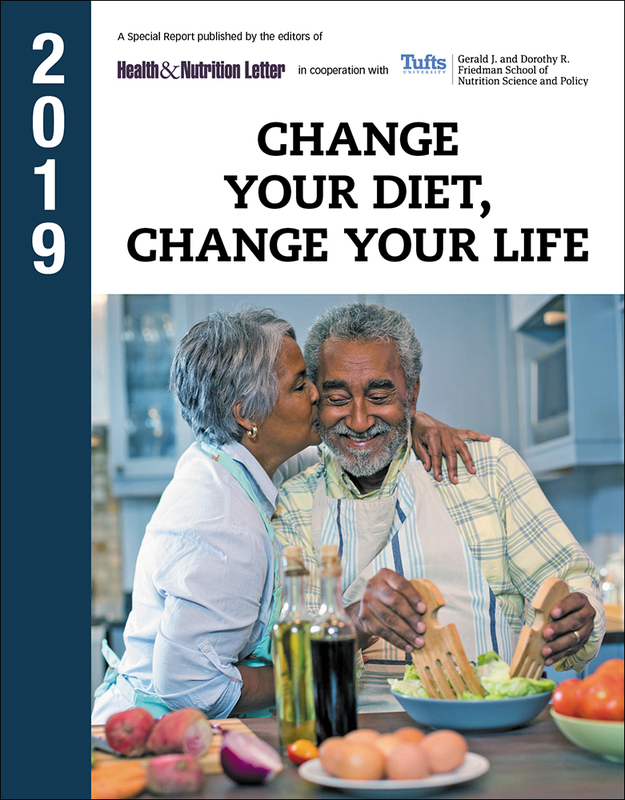 The nutrition experts at Tufts have just prepared a new report, Change Your Diet, Change Your Life, and you can discover for yourself just how quick, easy – and delicious – it can be to make a long-lasting difference in your good health. First, let me tell you what the report is not. It’s not a weight loss diet report. It’s not celebrity-endorsed. There are no points to count. No rigid menus. And no forbidden foods. Change Your Diet, Change Your Life is a guide to life-long healthy eating. It’s about how smart daily choices can give you years of freedom from the diseases of aging…lasting mental agility…greater physical vitality…and increased longevity. What is a “diet” anyway? When all is said and done, a diet is about just two things: how much you eat and what you eat. You know that certain foods have more health-boosting effects than others. At the same time, nutritionists are discovering that health depends on the totality of your diet. No one food or even a dozen foods can make or break a diet. Fad diets that fixate on a handful of foods actually deprive your body of the full spectrum of vitamins, minerals, and nutrients needed to provide real disease protection. When a diet takes away things your body needs, it’s best avoided. A healthy diet, one that reduces your risk for disease, is comprehensive and inclusive. It does not confine your choices, it refines those choices. You’ll discover the “trade secrets” to healthy eating! From the first page, you’ll see that Change Your Diet, Change Your Life, is unlike any “diet” report you’ve read before. It’s not rigid; it’s realistic. This report is about making smarter choices more often – without totally giving up those foods you enjoy. It’s about swapping. • At breakfast…have a whole orange instead of a glass of OJ. The orange gives you three times as much fiber…with just over half the calories! • At lunch…trade in mayo for hummus as a sandwich spread. Made from chickpeas, hummus has only a third of the calories of mayo. Plus, studies have linked eating legumes with lower blood pressure, a reduced risk of colon cancer, and a longer life. • At dinner…instead of coating chicken with a heavy breading, press chopped nuts onto the surface before baking. Nuts can improve cholesterol levels and boost heart health. We won’t test your will – we’ll build your skill! As I said, too many diets make you give up your favorite foods, even in moderation. Not Change Your Diet, Change Your Life. With clear, encouraging, and instructive guidance from the Tufts experts, you will be introduced to the growing number of healthy choices you have. You’ll learn about the expanding variety in grains – from amaranth and bulgur to teff and wheat berries. About healthier cuts of meat…the fish highest in omega-3-rich oils…and more. You’ll get tips for preparing foods to retain the most nutrients. The report will tell you which frozen vegetables can be a smarter (and cheaper) choice than fresh. And you’ll even learn money-saving tips that make healthy eating more affordable. Healthy eating – that tastes great! That’s what you’ll discover in Change Your Diet, Change Your Life. You can attain the lasting benefits of a health-boosting diet while enjoying an abundant and varied wealth of food choices. Indeed, there is no one perfect diet. A healthy diet pattern is built around fruits, vegetables, whole grains, and lean proteins and minimizes saturated and trans fats and sodium. Additionally, with a healthy diet, calories are appropriate for a healthy weight. Change Your Diet, Change Your Life doesn’t give you rules; it gives you tools. It is written to help you develop the skills, form the strategies, and build the habits to eat well and live health-fully for the rest of your life. Not just what and how – but why as well! Anyone can say, “Eat your spinach.” Our editors will tell you why. (It’s rich in vitamins C and K, and lutein which may protect the brain and eyes.) And if you don’t like spinach try Kale. Change Your Diet, Change Your Life comes to you from the acclaimed Tufts Friedman School. You’re not getting speculation; you’re getting facts that the nation’s leading nutrition experts have learned from scientific research. This is information you can take to the market, to the kitchen, and most important, to your table. You’ll learn about an easy substitution that can reduce your risk of diabetes by as much as 35%…a protein source that can protect against age-related macular degeneration…and the daily beverage that can reduce the risk of stroke. Want to know if that bread really is “whole grain?” We’ll tell you what to look for. You’ll find out how to select and store fruits for maximum flavor and nutrition. You’ll be introduced to smart swaps for reducing trans and saturated fats. And you’ll be alerted to a number of small shifts you can make that will add up to big steps toward a healthier diet. Plus…menus you’ll love and recipes you’ll savor! “What’s for dinner (or lunch, breakfast, or snack)” will be easy to answer and healthy and tasty to enjoy. Change Your Diet, Change Your Life gives you dozens of menus and recipes as examples and inspiration for putting foods together in a healthful and appetizing way. There are delicious entrees and tempting desserts such as Beef Stir-Fry with Green Beans…Chicken Enchilada Soup…Caprese Pasta Salad…Avocado and Rock Shrimp Pizza…Chocolate Raspberry Brownie Bites with Walnuts. Discover the healthy rewards awaiting you! Change Your Diet, Change Your Life gives you more than food for thought. It provides the essential information you need to consistently and confidently make the most healthful food choices. It will show you how easily you can adopt eating patterns to incorporate foods that improve your health, increase your resistance to age related illnesses, and help you to a longer life. Change Your Diet, Change Your Life is available to you at the lowest price you’ll find anywhere. The cost is a very small price for information that can make such a large difference in your life or that of a loved one. Order today and if the report doesn’t match your expectations, let us know and we’ll fully refund your money, no questions asked. So, come and get it! Send for your risk-free copy of Change Your Diet, Change Your Life today!